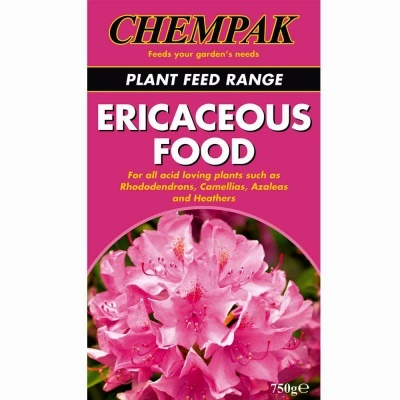 Chempak® Ericaceous Plant Food 750g Carton - Soluble plant fertiliser for acid-loving plants, providing essential trace elements unavailable in high pH soils. Unique lime-neutralising formula combats hard, limey water producing plants that show strong growth and good foliage. Plants that will benefit from Chempak Ericaceous Plant Food includes Rhododendrons, Azaleas, Hydrangeas, Camellias, most Heathers, Conifers, Pieris and other acid-loving plants. Includes an acidifier to lower soil pH, thereby releasing further natural trace elements.